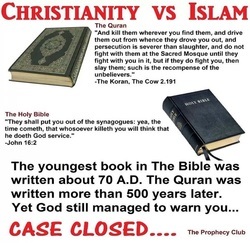 Are Christianity & Islam compatible?? 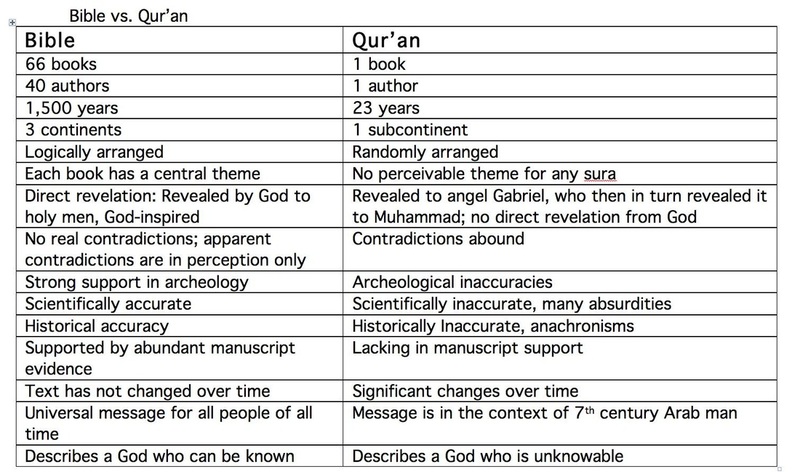 Islam reveres the quran as their holy book. 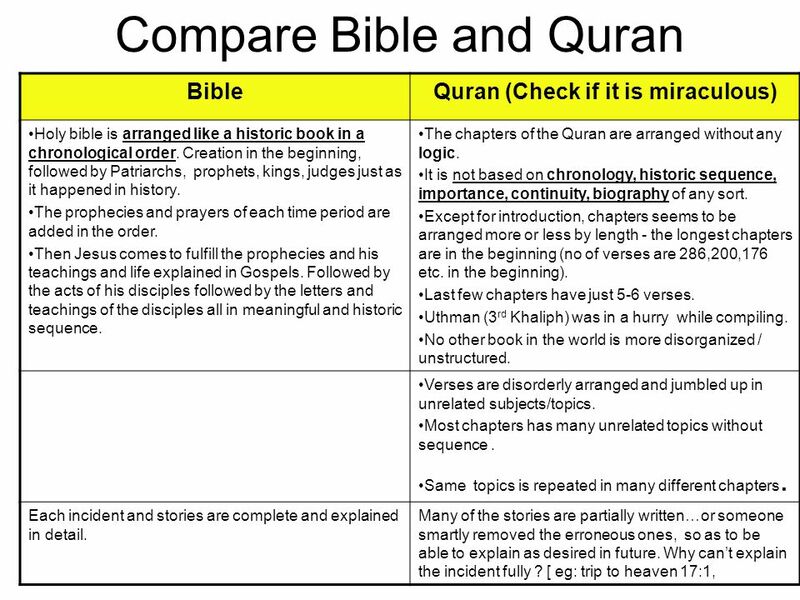 The quran states that Jesus did not die on the cross nor is He the Son of God, because Allah can not have a son. 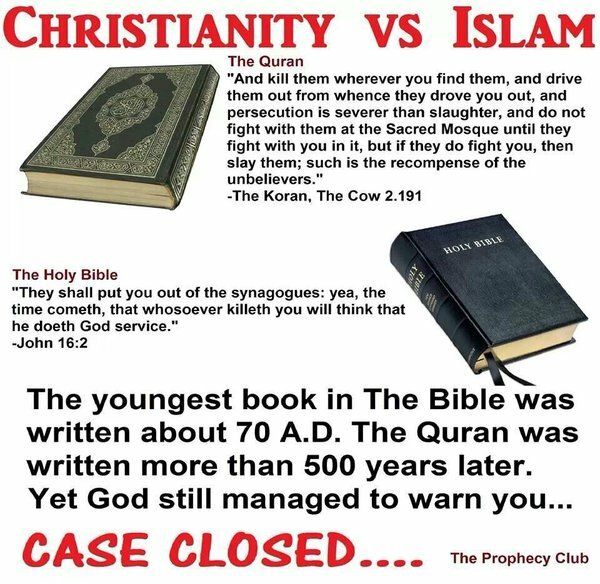 However the Bible, which the quran CONFIRMS as true, says any who deny Jesus being the Son of God is a liar and an antichrist. On top of that ALL 4 Gospels say that Jesus was crucified and rose after 3 days leaving an EMPTY TOMB. Mark 16:6 "Jesus of Nazareth, which hath been CRUCIFIED" | Luke 23:33 "There they CRUCIFIED him." | John 19:23 "Then the soldiers, when they had crucified Jesus,... | Acts 2:36 [Stephen speaking] "this Jesus, I say, whom ye have CRUCIFIED." | Acts 4:10 [Peter speaking] "Jesus Christ of Nazareth, whom ye have CRUCIFIED, whom God raised again from the dead,"
God in a voice from Heaven, the angel Gabriel, Demons, & Jesus himself ALL call Jesus the Son of God. 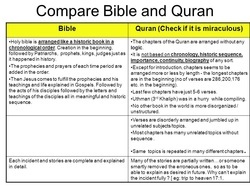 Placed side by side, it is painfully obvious that Islam and its quran are completely incompatible with true Christianity that is based solely off the Bible. Muslim's relationship to Allah is that of a SLAVE to a god who lies, deceives, and constantly changes from Ch 4 to Ch 9. Christian's relationship with Yahweh the God of Israel & the Bible is that of an ADOPTED SON to a God who can not lie, is transparent, is truth, and never changes from Genesis to Revelation. 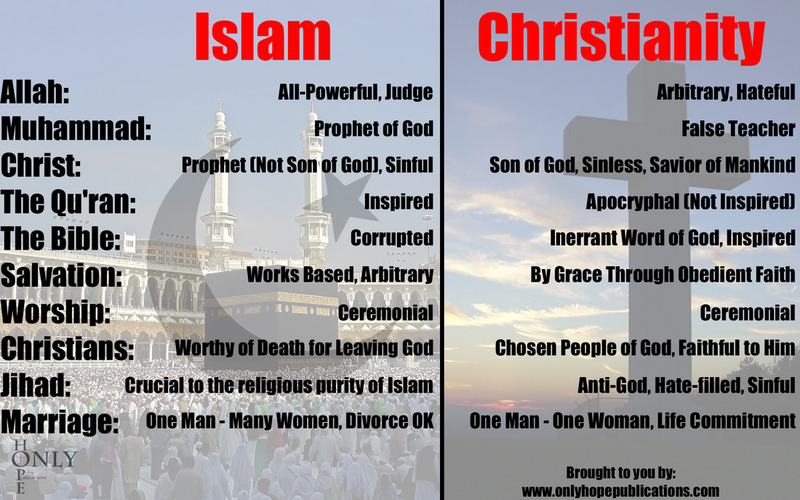 Islam and Christianity also differ on how to become saved and go to Heaven. Muslims salvation is based on if a Muslim's "good works outweigh his bad ones" AND "IF Allah so WILLS IT", he may be forgiven of all his sins and then enter into Paradise. 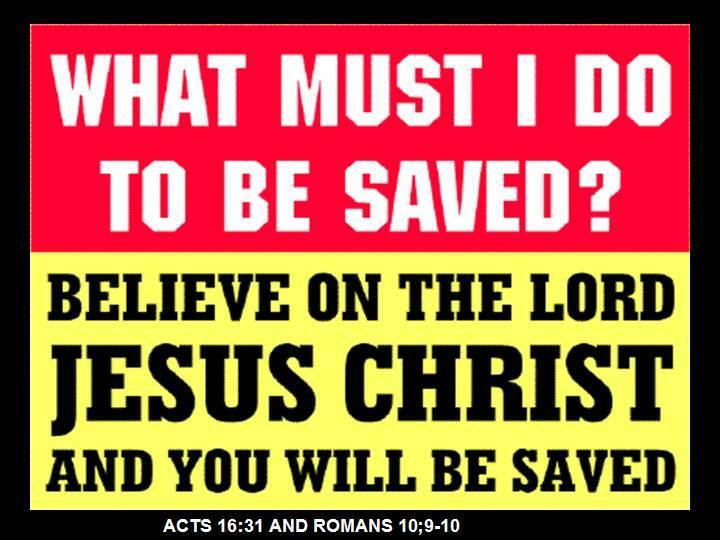 Christians KNOW they are saved by BELIEVING on Jesus as their Savior from ALL sins, as clearly stated in landslide of verses from the Bible, as the ONLY way to be made good enough to get to God and Heaven. Islam you have NO ASSURANCE of salvation. Even if a Muslim could do enough good to outwieght their bad, the final call is up to Allah. Allah is deceptive, unknowable, and nothing assures Muslims Allah might not trick them and deny them paradise. Contrast that with the God of the Bible who is completely knowable, truthful, UNCHANGING, and who desires ALL MEN to be saved, there is much more assurance to meet His requirements which is that you simply BELIEVE and place your trust in Jesus of Nazareth who even God in a booming voice from Heaven, the angel Gabriel, and even Demons admitted was the SON of God. Wouldn't you want to trust such a loving God of the Bible who knew men couldn't make it to Heaven on their own and were headed for Hell, took it upon Himself to provide a way out FREE of anything we could do ourselves? This God, Yahweh, instead of having us earn our own way by sent His only Son, Jesus of Nazareth, to die to pay the penalty for ALL SINS, so that by simply BELIEVING on Him and His death on calvary, we would be made right with God and escape Hell and go to Heaven. Wouldn't you want to that simple thing God askes and be SURE of going to Heaven? Just pray this prayer and BELIEVE upon the Son of God Jesus today. He was more than a mere prophet, He was God himself.